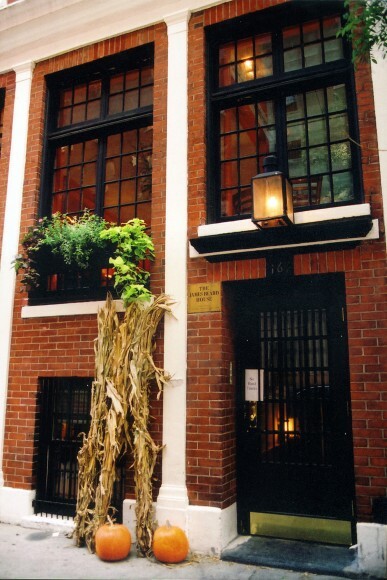 On Thursday night, October 30, at the James Beard Foundation in New York, Francesco Palmieri of the Orange Squirrel Restaurant prepared a dinner based on recipes from Mary and Vincent Price’s masterful cookbook, A Treasury of Great Recipes (1965). 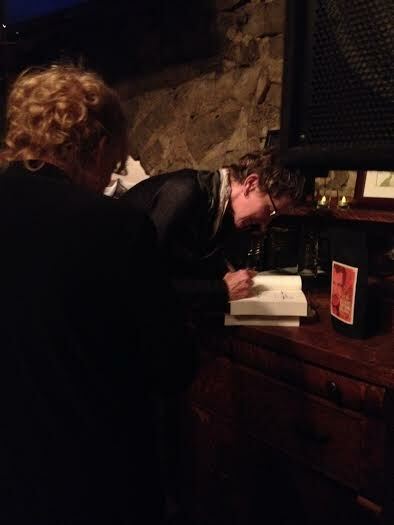 Victoria Price, Vincent’s daughter, co-hosted the event and introduced the Vincent Price Signature Wine Collection. I planned to be there, and was looking forward to it. Instead I was home, sidelined by torn ligaments, eating soup for dinner. 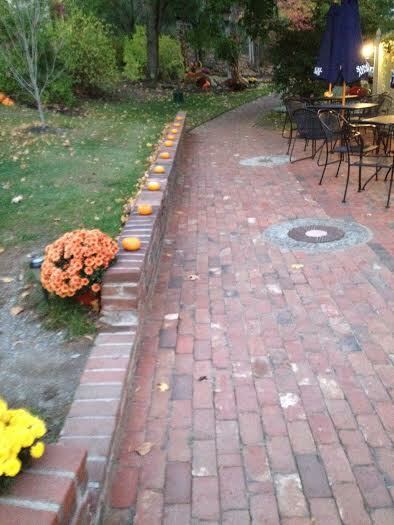 I am disappointed, but last Saturday night’s (Oct. 25) dinner at the Inn at Millrace Pond has softened the blow. 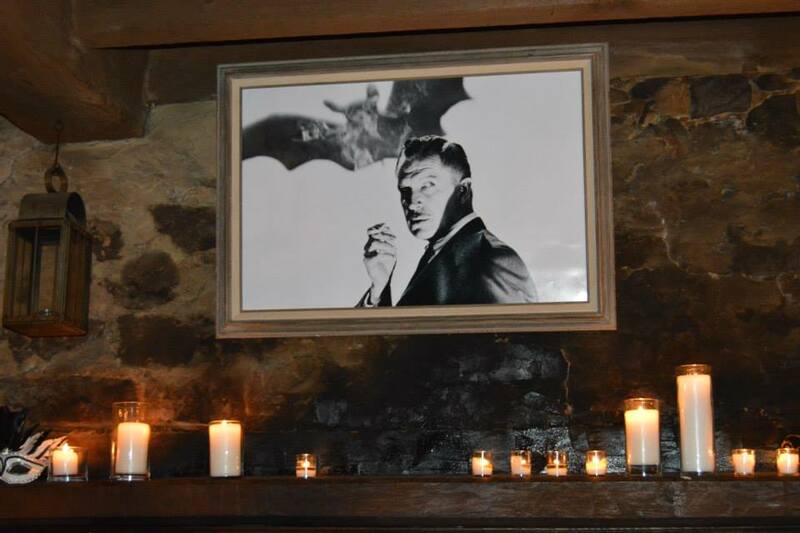 Jody Price, Vincent’s grandson, hosted the Inn’s third tribute dinner to Vincent Price. While we dined, he played inspired instrumental guitar. After dinner he talked about his memories of his grandfather, and gave an entertaining description of his father’s life in films, and as an art-lover and foodie. My favorite of his wonderful stories was the story of the time when his phone rang and a friend woke him up, shouting, “Hey, turn on your TV! You’re on the Simpsons!” It turned out that in the “Sunday, Cruddy Sunday” episode that was shown after the 1999 Super Bowl, the voice of Vincent Price tells Marge Simpson that his grandson, Jody, will bring her the missing feet from her celebrity craft kit. Jody shows the crowd (my mother) Sally Murphy’s first edition copy of the cookbook. Jody was joined during the question and answer period by Victoria, who arrived late after a long day at the Chiller Theater Toy, Model, and Film Expo where she met her father’s horror fans and gave a talk about his life. Jody’s brother Keir Price was at the dinner too. Victoria spoke of how, on the 21st anniversary of the day of her father’s death, he would have been pleased that the three of them were together, since for so many years their family was in different parts of the country and didn’t see each other often enough. Jody and Victoria share a story. I savored the crab stuffed avocado with wild mushrooms and almonds. That is a recipe I will definitely try to emulate. For the entrée I had the filet mignon, potatoes and vegetables. I knew they wouldn’t be based on a recipe in the cookbook, but I knew I made the right choice when I tasted the melt-in-your-mouth filet. The Inn uses vegetables from nearby Tranquility Farm, and the carrots were among the tenderest I’ve tasted. For dessert I had the apple lattice pie. Since I am an avid apple pie baker, I couldn’t resist, and I was not disappointed. Those in my group who had the cheese cake said it was the best they ever tasted. Another recipe for me to take on! The rest of my family reported that every dish exceeded their expectations, especially the pan-seared scallop and shrimp risotto Milanese. 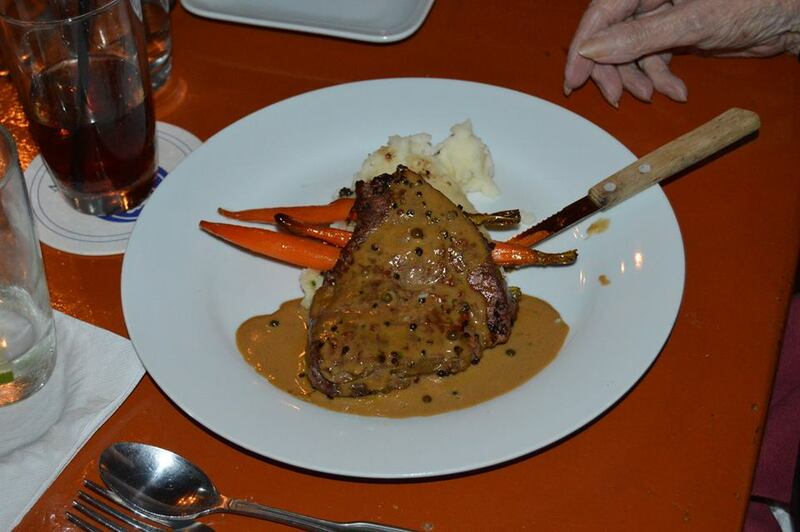 We all found the quality of the meal and the lovely surroundings exceptional for the price. If it hadn’t been a special event, it still would have been well worth it. 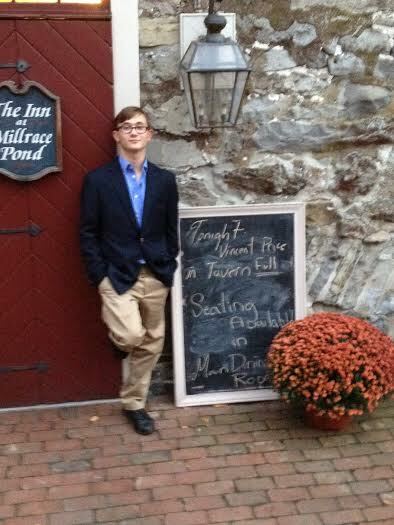 My son, Ian Horowitz, at the entrance, next to the “Vincent Price Dinner, Tavern Full” sign. 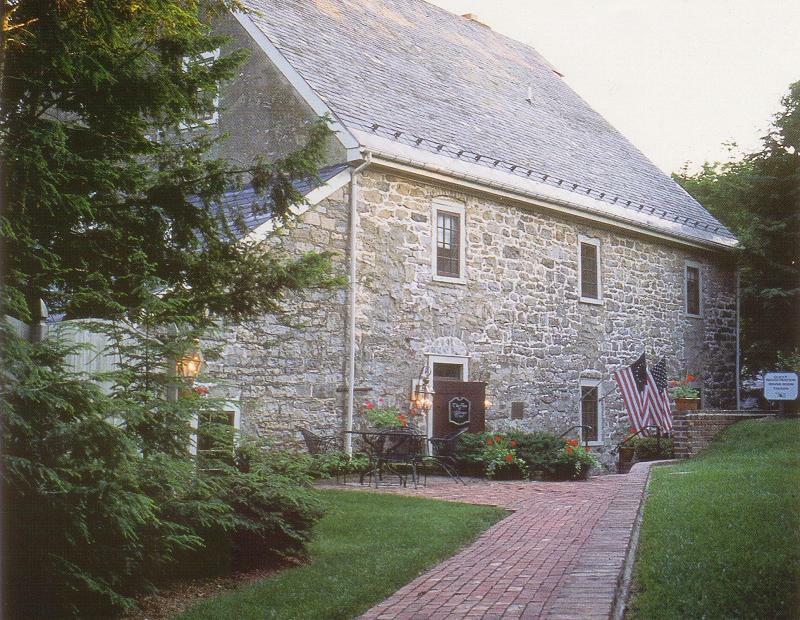 The inn is simply lovely—we dined in the Grist Mill, built in 1769 by Moravian settlers and restored 20 years ago. Upstairs rooms have been decorated period style, 3 with canopy beds, all with beamed ceilings, and modern amenities including whirlpool tubs. The main floor holds the large dining room. 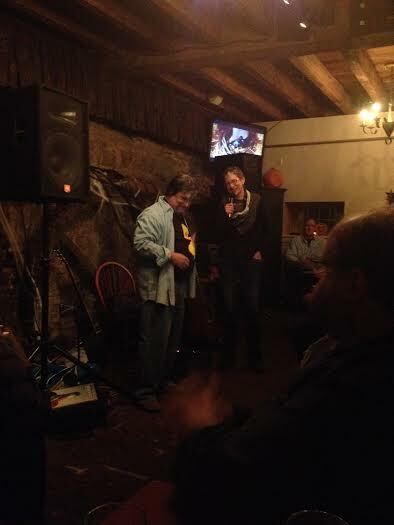 We dined in the smaller tavern, downstairs, and the trip down the stairs was an adventure in itself! 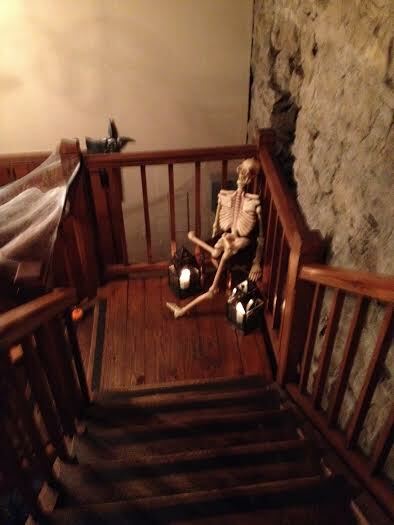 Skeleton on stairs down to the tavern. 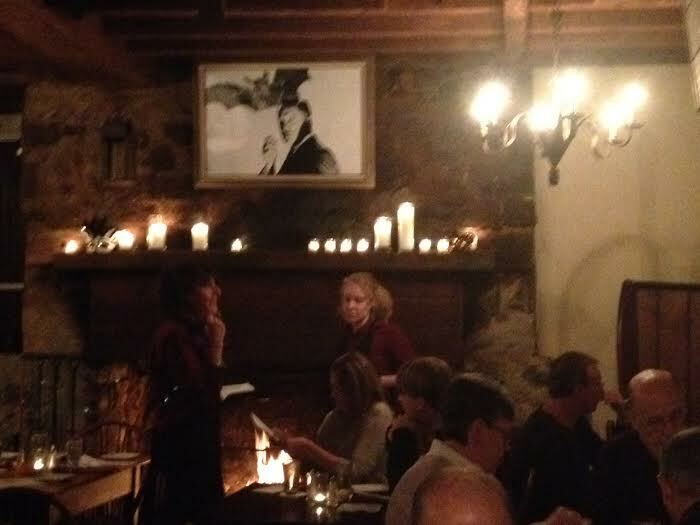 The tavern also features beamed ceilings and a large stone fireplace. 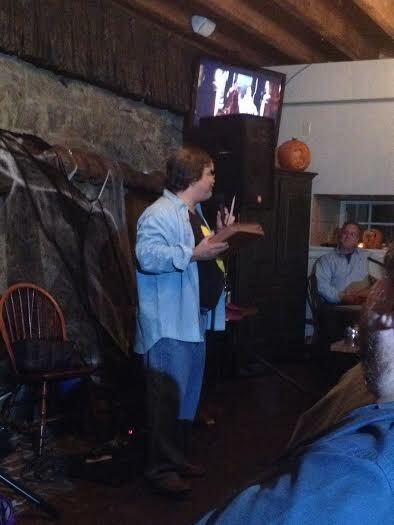 During the dinner Price’s Edgar Allen Poe films were shown on two screens. “He once said that he might not have had the best career of all actors, but no one had as much fun as him,” Jody told us. 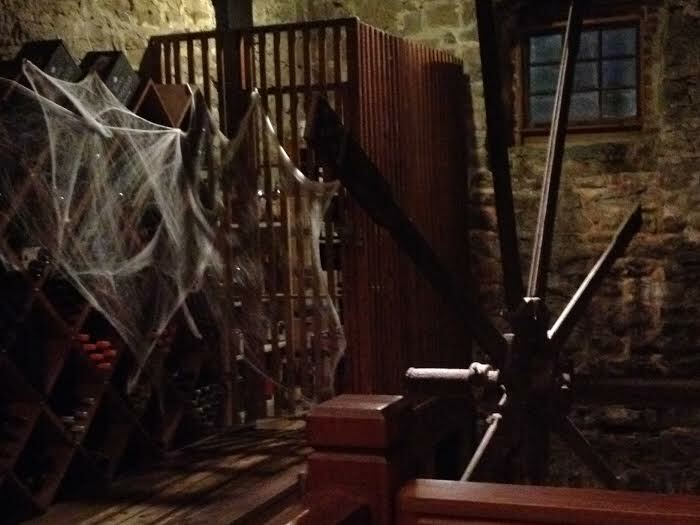 I think Vincent would have loved the spider web strewn over the wine collection, next to the giant grist mill wheel. 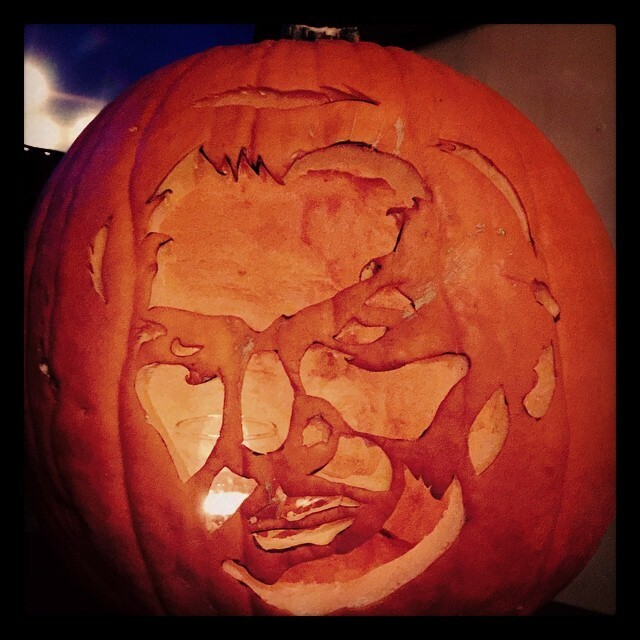 He would have been delighted by the pumpkin with his face carved in it. The talented, creative staff outdid themselves in their decorations. Thank you, Jody, for hosting this event and sharing your family’s celebration. It was a pleasure, and a lot of fun, to honor Vincent Price’s life with you. I was especially pleased that my mother, Sally Murphy, was able to meet the Price family, and that our family—two of my cousins (whose mother met Vincent Price in Bermuda with Mom), my husband, son and brother—were able to be there for this very special evening. 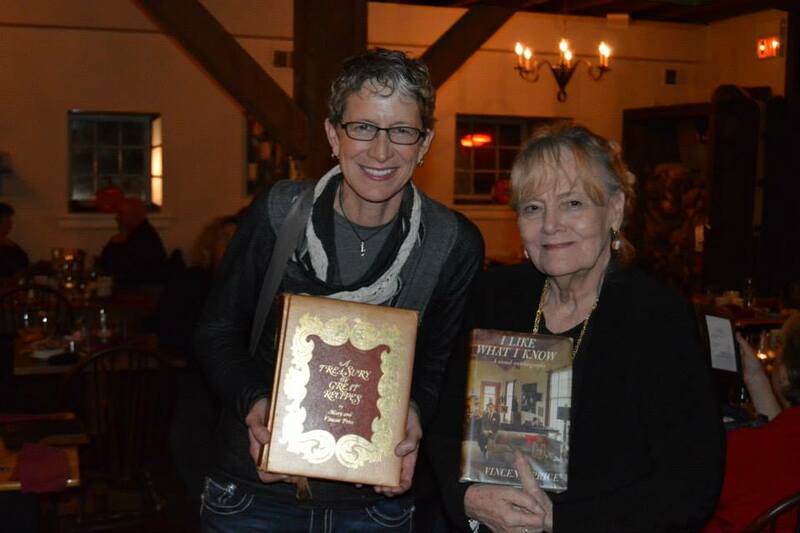 Victoria Price and Sally Murphy, holding the first editions Vincent Price inscribed in 1985 for Mom when she met him on a trip to Bermuda. 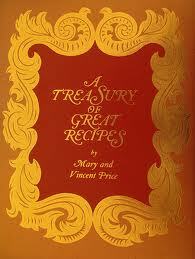 Victoria inscribes a copy of Vincent Price: A Daughter’s Biography, newly released in paperback, for Mom. Although my family and I have been cooking from the cookbook since it was published, this was the first restaurant event we’ve attended that offered some of those recipes. 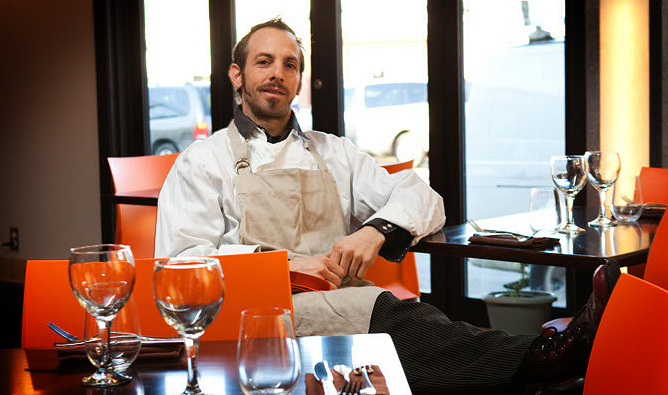 Well done, chef! For more information about the Inn at Millrace Pond, see http://www.innatmillracepond.com. The Vincent Price Collection II, a seven-film, four-disc Blu-ray set from Scream Factory, was released this month and includes House on Haunted Hill, Dr. Phibes Rises Again, The Raven (directed by Roger Corman, loosely based on Edgar Allan Poe’s poem, stars Price, Peter Lorre and Boris Karloff along with a young Jack Nicholson), The Comedy of Terrors, The Tomb of Ligeia, The Last Man on Earth and The Return of the Fly.